Cool filtering. Was it done with despeckle? It makes it seem like a watercolour illustration. The lines and colours in this are nice and bold. I really like it. I like this alot, mine was similar but you took a different angle on it. I do wish that the image were more clear and crisp. Maybe it was the jpeg compression, for example where the empty glass meets the table, its blury or somthing. Also its a bit distracting were the white background meets the black. Just a thought. Very nice shot. I like the reflection. Great angle and framing. Unique image with creative lighting. layout is nice. color is very nice. I like the effect of the sign in the wash on the table. a little over corrected in netimage, or photo shop. Image isnt sharp as it could be. Message edited by author 2003-02-10 16:08:53. I've quite a few afters in my time. Cute idea to have the bar sign reflection. 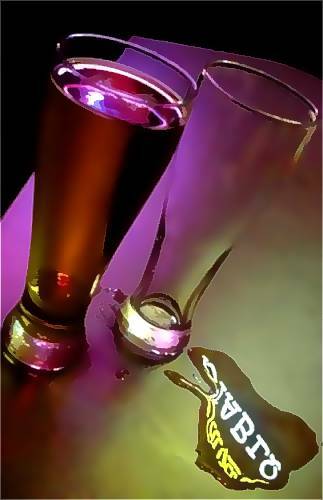 I like the reflection in the bit of spillage, but the purple lighe just in my opinion bring out the best photographic qualith in beer. Proudly hosted by Sargasso Networks. Current Server Time: 04/18/2019 07:08:13 PM EDT.